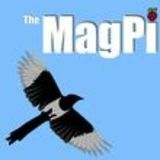 In last months article, we equipped the Raspberry Pi with a BitScope Micro add-on board and installed the BitScope digital storage oscilloscope (DSO) software. Now we are ready to delve into the fascinating field of electronic measurement with a fully-fledged DSO. represents 2V. With 8 squares stacked up on the Y-axis we are able to measure a maximum of 1 6V. Now connect the red test lead to pin CHA and the black test lead to pin GND, opposite pin CHA on the BitScope Micro. Fig. 2 shows the pin layout of the BitScope Micro to help you to select the right pins. 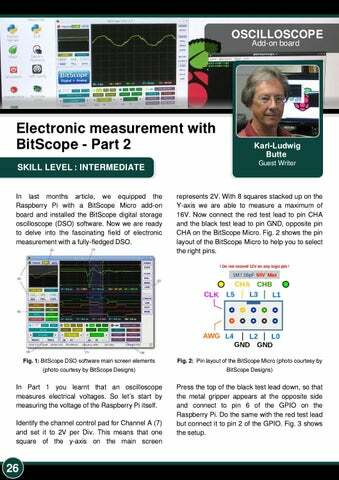 In Part 1 you learnt that an oscilloscope measures electrical voltages. So letâ&#x20AC;&#x2122;s start by measuring the voltage of the Raspberry Pi itself. Press the top of the black test lead down, so that the metal gripper appears at the opposite side and connect to pin 6 of the GPIO on the Raspberry Pi. Do the same with the red test lead but connect it to pin 2 of the GPIO. Fig. 3 shows the setup.